It was a very wet morning and we found the river shrouded in a veil of fog. As we stood by the car and rigged up our 11-foot rods, the fog began to slowly burn off, revealing classic runs just waiting for us to swing our flies through. After attaching the reel and getting the 27-foot shooting head out of the final guide and attaching a leader, I tied on the most tantalizing fly I could find. We were on the hunt for … smallmouth bass? 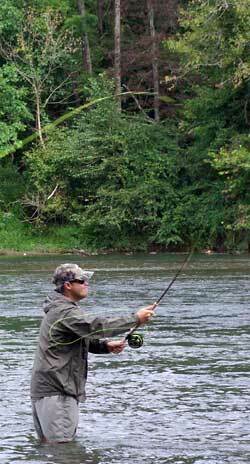 I blame my obsession with switch rods on two people and one fish: Kirk Deeter, Andrew Bennett, and steelhead. Deeter for a post that made the “trout spey” notion seem like a good enough justification, and Bennett for his ridiculously alluring posts on his Deneki Outdoors blog. And even though the closest steelhead is a day’s drive away, I am preparing for the trip that will eventually happen. Some will argue that switch rods are nothing more than a fad and that to truly learn to spey casting one must acquire and use a spey rod. I am not qualified enough to participate in a full-on debate yet, but for a relative beginner the ability to switch from two-handed delivery to a traditional one-handed cast has great appeal. Tom Rosenbauer, resident fly-fishing guru at Orvis, suggested the new Access rods for starters. The Access line contains both single-handed rods and switch models in 5-, 6-, 7- and 8-weights. For the rivers I fish, I felt the 6-weight would be enough to cast some of the large streamers I was hoping to throw, without overpowering the average fish. After much research and a leap of faith, I lined it with RIO’s Skagit Spey 350 grain. This line has an overall length of 120 feet and a 27-foot head. I went with the Skagit-style line because the sinking tip would help my streamers get deep. The Access line uses the same taper system of the much pricier Helios series. The rootbeer-colored blank is accentuated by orange wraps, and the reel seat is woven graphite with milled aluminum hardware. While I don’t find it as attractive as some others, the reel seat is very light and allows the rod to balance high on the cork for leverage in various two-handed casts. All of the Access switch rods are what Orvis calls “tip-flex,” which basically translates to a faster-action rod. Comparing the action of an 11-foot rod versus a traditional 9-foot rod is tough but it is fair to say the flex here is mostly in the last couple of feet of the tip. I was thrown off by the girth of the rod, but again that just comes from my experience with nine footers. With Skagit-style lines, the rod has the ability to shoot line effectively using basic spey and switch casts. While these rods are marketed as tip-flex models, I personally felt the Access switch rod could use a bit more flexibility in the bottom half. A better way to say it is that a beginning caster could use more flex to feel the loop forming behind them. The rod may also seem a bit hefty to the switch rod beginner. However, on further research the 5.25-ounce rod is almost an ounce lighter than other rods in its price point. For instance, the much pricier (and 6-inch longer) Sage One Switch 6-weight comes in at 5.25 ounces as well. With the Access line, it seems that Orvis has put an emphasis on functionality. While you may lose some frills at this price point, for $425 I doubt there is a more functional switch rod on the market.